Former LTTE members who have resettled in Paduvaan-karai region of Batticaloa district complain that they are being systematically neglected in the provision of even the bare minimum assistance in the form of housing and loans. The SL officials have also gone to the extent of citing a section of the ex-LTTE families being away from Paduvaan-karai during the times of war as an excuse to denounce such assistance. In the meantime, The Tamil farmers and fishermen in Paduvaan-karai blame SL President Maithiripala Sirisena for silently introducing a new ‘leasing’ scheme for Sinhala colonists to seize the lands of Tamils in Paduvaan-karai region. Sirisena's Mahaweli Ministry is also alleged of re-channelling the water away from tanks used by Tamils in Batticaloa to his Sinhala electorate of Polonnaruwa. The systematic deprivation of assistance to former-LTTE members and the structural genocide targeting Tamil dairy and agricultural farmers in Paduvaankarai should be been coupled with each other, Tamil civil officials in Batticaloa said. The SL President's Mahaweli Ministry, accompanied by Sinhla military, home guards paramilitary and extremist Buddhist monks have been trying to seize the fertile lands for Sinhala colonists from Polonnaarwa for a long time. The tendency developed into almost a war-like situation after 2013. Thousands of acres lands, traditionally used by Eezham Tamil dairy farmers as pasturelands for their cattle were taken over by SL military-backed Sinhala ‘home guards’, who were converting the grazing lands into their farming lands. Finally, Tamil farmers were also assaulted by the home-guards and Forest Department guards. However, following repeated complaints, legal suits and finally the Tamil dairy farmers going to the extent of waging a continued protest of boycotting milk supplies to SL government-owned Milco company in 2016, the encroachments came to an end in Mayilaththa-madu area towards the end of 2016. A number of huts put up by the intruding Sinhala were dismantled. 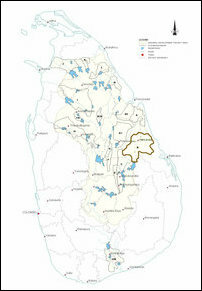 Around 300 Sinhala colonists were instructed to vacate from the pasturelands. A UN official was also brought to witness the dismantling process. But, after a short break, Maithiripala Sirisena's Mahaweli Ministry has started to scheme a major Sinhala colonisation programme particularly since mid-2017. The new new scheme is targeting the pasturelands of Eezham Tamils in at least two of the administrative divisions of Paduvaankarai region. While 320 Tamil dairy farmers from the two divisions of Ea'raavoor-pattu (Chengkaladi) and Koa'ra'laippattu South (Kiraan) are already struggling without adequate pasturelands for their cattle, Maithiripala's Mahaweli ministry has sketched out a new plan to distribute 49 acres per Sinhala colonists through a long-term ‘leasing’ programme. 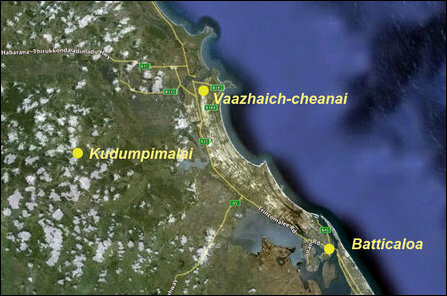 Ezhuvaan-karai and Paduvaan-karai are respectively the stretches of land on the eastern and western banks of the Batticaloa lagoon in the Batticaloa district. 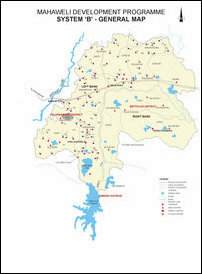 Paduvaankarai region comprises three DS divisions, Poaratheevuppattu, Ma'nmunai West and Ma'nmunai Southwest and parts of Ea'raavoorpattu Chengkaladi division. with at least 20,000 families who are dependent on agriculture. From data provided by Agriculture Department officials, paddy can be cultivated in a total of 58,374 hectares (144,184 acres) of land in Batticaloa district. Out of these lands, 49,339 hectares (121,867 acres), are meant for highland crop cultivation. According to the 2004 annual report, 40,000 families are directly dependent on agriculture for their livelihood in the district. During the Chi'ru-poakam (known as Yala season in Sinhala) cultivation, water required to irrigate the paddy land was obtained from lakes in the areas such as Unnichchai, Vaakaneari, U'rukaamam, Thumpangkea'ni, Kiththulvela, Kaddumu'rivu and Kadukkaamunai. Also last year, the Tamil farmers, who are dependent on irrigation from Vaakaneari tank in Koa'ra'laip-pattu South DS division, complained that the water intended to their tank was being diverted to Sinhala military run farms West of Vadamunai. The water was also being re-channelled from Vaakaneari tank to Sinhala-owned tourism industry in Paasik-kudaa, they complained. In the meantime, more than 1,200 Eezham Tamil fishing families, who are dependent on fresh water fishing in the tank, were severely affected by the diversion of the water. 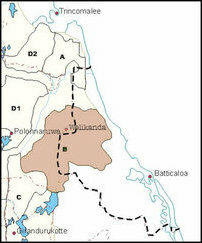 Meanwhile, the occupying Sinhala Army having its main base at Kudumpi-malai (which is also known as Thoppik-kal and Baron’s Cap) area in the interior of the northwestern hinterland of Batticaloa, is also Sinhalicising the area by bringing in Sinhala fishermen to engage in fresh-water fishing at Meeraa'nda-ku'lam and by promoting ‘tourists’ from South to engage in leisure activities in the area, Kudumpi-malai villagers complain.